Before setting up a new project, it's important to understand what the Project Types or Project Phases mean in the system as this is the first decision to make when setting up a project. Define project types in the RADAR system. A user must have permission to add/edit project. A Preconstruction project is a project not yet awarded or under contract. This includes projects in the bid, negotiation, design and/or budget phase. They are not under contract and your company may or may not be awarded a contract for projects in this phase. These projects have been awarded to your company and you will have a contract with a client. Selecting the Construction phase and importing a preconstruction project, will import all project data from the preconstruction phase to the new Construction project. 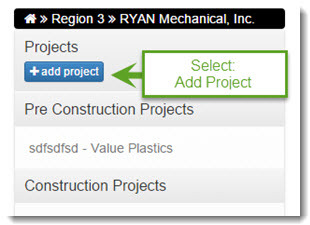 Once the project type is selected, you can continue setting up the project.